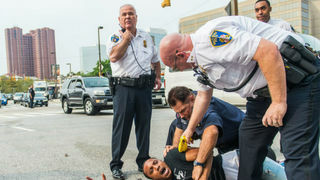 “Our Time is Now”: Baltimore State’s Attorney Mosby Charges Six Baltimore Cops in Freddie Gray Death | Democracy Now! AMY GOODMAN: We begin today’s show in Baltimore, where officials have lifted a 10:00 p.m. curfew and National Guard troops have begun to withdraw as peaceful protests continue over the death of Freddie Gray. Gray’s family and attorney say his voice box was crushed, his spine was “80 percent severed at [his] neck,” they say. This comes after Baltimore State’s Attorney Marilyn Mosby dramatically announced Friday she had filed charges against the six officers connected to Gray’s arrest and transport on April 12, saying they illegally arrested Gray without probable cause, then ignored his pleas for medical help. MARILYN MOSBY: As the city’s chief prosecutor, I’ve been sworn to uphold justice and to treat every individual within the jurisdiction of Baltimore City equally and fairly under the law. I take this oath seriously, and I want the public to know that my administration is committed to creating a fair and equitable justice system for all, no matter what your occupation, your age, your race, your color or your creed. It is my job to examine and investigate the evidence of each case and apply those facts to the elements of a crime in order to make a determination as to whether individuals should be prosecuted. This is a tremendous responsibility, but one that I sought and accepted when the citizens of Baltimore City elected me as the state’s attorney. And it’s precisely what I did in the case of Freddie Gray. Once alerted about this incident on April 13th, investigators from my police integrity unit were deployed to investigate the circumstances surrounding Mr. Gray’s apprehension. Over the course of our independent investigation in the untimely death of Mr. Gray, my team worked around the clock, 12- and 14-hour days, to canvas and interview dozens of witnesses, view numerous hours of video footage, repeatedly reviewed and listened to hours of police videotaped statements, surveyed the route, reviewed voluminous medical records, and we leveraged the information made available to us by the police department, the community and the family of Mr. Gray. Officer Caesar Goodson is being charged with second-degree depraved-heart murder, involuntary manslaughter, second-degree negligent assault, manslaughter by vehicle by means of gross negligence, manslaughter by vehicle by means of criminal negligence, misconduct in office for failure to secure a prisoner, failure to render aid. Officer William Porter is being charged with involuntary manslaughter, assault in the second degree, misconduct in office. Lieutenant Brian Rice is being charged with involuntary manslaughter, assault in the second degree, assault in the second degree, misconduct in office, false imprisonment. Officer Edward Nero is being charged with assault in the second degree, intentional; assault in the second degree, negligent; misconduct in office; false imprisonment. Officer Garrett Miller is being charged with intentional assault in the second degree; assault in the second degree, negligent; misconduct in office; and false imprisonment. To the people of Baltimore and the demonstrators across America, I heard your call for “no justice, no peace.” Your peace is sincerely needed, as I work to deliver justice on behalf of this young man. To those that are angry, hurt or have their own experiences of injustice at the hands of police officers, I urge you to channel the energy peacefully as we prosecute this case. I have heard your calls for “no justice, no peace”; however, your peace is sincerely needed, as I work to deliver justice on behalf of Freddie Gray. Last, but certainly not least, to the youth of this city, I will seek justice on your behalf. This is a moment. This is your moment. Let’s ensure that we have peaceful and productive rallies that will develop structural and systemic changes for generations to come. You’re at the forefront of this cause. And as young people, our time is now. AMY GOODMAN: That was Baltimore State’s Attorney Marilyn Mosby speaking on Friday. She’s the youngest state’s attorney of any major city in the United States. Police union officials are now calling for Mosby to appoint an independent prosecutor, saying her marriage to Baltimore City Councilmember Nick Mosby is a conflict of interest because his district includes the area where Gray was arrested. Marilyn Mosby addressed this during her news conference on Friday. AMY GOODMAN: All six officers charged in Gray’s death have since posted bonds of $250,000 to $350,000. Meanwhile, Allen Bullock, one of the 18-year-olds who turned himself in for participating in the riots, is facing a bond of $500,000. His stepfather, Maurice Hawkins, and mother, Bobbi Smallwood, reacted to the amount in an interview with The Guardian. AMY GOODMAN: Other protesters in Baltimore have seen their bonds set as high as $100,000 for disorderly conduct.